I’ve always wondered how John Irving pitches his novels. They span years, feature a dozen or more characters, and contain stories that cannot possibly fit in a synopsis. A synopsis cannot do his novels justice. A plot outline will only reveal a tall tale with no heart. 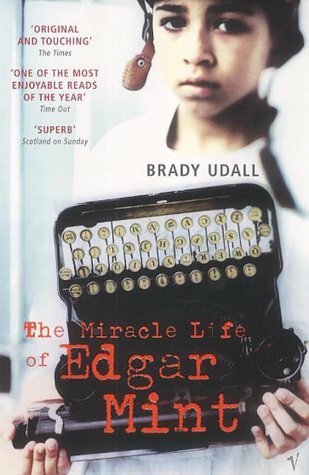 Brady Udall’s The Miracle Life of Edgar Mint reminded me very much of John Irving’s novels, and it certainly contains the elements that tall tales are made of. Edgar Mint, half Apache and half Caucasian, is run over at the age of seven by a mailman’s vehicle. The vehicle’s wheel runs right over his head, and the mailman, howling, touches his skull and feels it give. That boy’s dead, a man in the crowd says, but Edgar survives (albeit with a lumpy head). And so his odyssey begins: from St. Divine’s, a hospital for the poor; to Willie Sherman, a school for delinquents; to a house filled with sad Mormons, to a doorstep in the rain. We know the basic elements of journeys: a growing collection of friends, a goal, self-discovery, many adventures – and that’s what we get here. Sounds old? Perhaps, but Edgar Mint is a compulsive read, a captivating story. It moved me.